Peter J. Martin & Son are a long established family firm buying and selling fine quality antique and later furniture. Our warehouse and showroom is located at Unit 21 of The Vinery Complex, just a mile from the beautiful and historic West Sussex town of Arundel. We are also pleased to offer a selection of items from our retail area just inside the front door at The Salisbury Antiques Centre, 94 Wilton Rd, Salisbury, Wilts. The business was founded by Peter Martin some 45 years ago in the picturesque East Berkshire town of Eton – in the shadow of Windsor castle and home to the world famous Eton College – and was joined by son Paul just over 25 years ago. Peter has now officially retired and handed over the reins to Paul, but continues to work for the business on a consultancy basis. We still have an office in Eton, but relocated the major part of our business to our Arundel warehouse back in 2013. Should you spot something on this website that is of interest but would like to see it ‘in the flesh’, just drop us a line or give us a call and we’ll work out the most mutually convenient way for you to view the item in question. 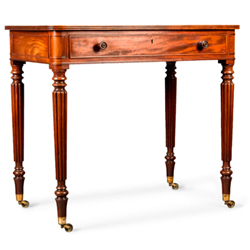 We carry a large and diverse range of furniture for the home and office, in oak, walnut, mahogany and exotic timbers. All restoration is carried out in the traditional manner by our own skilled craftsmen. Our stock dates mostly from the 18th to early 20th centuries, although we also offer a few later, high-quality pieces of traditional style. Also, from time to time we may have a limited range of paintings, prints, rugs and objects in stock, depending on what fortune sends our way. With two buyers constantly on the road searching for stock there are always fresh pieces available for your perusal. And if we haven’t got exactly what you are looking for, our extensive range of contacts in the trade means there’s a good chance we can find it for you. Peter J Martin & Son are proud to be long-standing members of the FSB (Federation of Small Businesses).